Susan Partridge is one of the country’s best endurance runners having had success on the track and over the country but it is on the roads that she has really made her mark. This profile by Colin Youngson has been written at a time when she is still running and will require up-dating in a few years time. For now, here is Colin’s profile of this talented athlete. Susan Partridge was born on the fourth of January 1980. On the 27th of August 2011 she represented Great Britain in the World Championship marathon in Daegu, Korea. Her international career has been impressive. She has run in: the World and also the European cross-country championships (helping Britain to team gold in the latter); the 2006 Commonwealth marathon; the 2010 European Marathon; and has top-thirty places from the World Road Running and World Half-Marathon Championships. Only the Olympics to go! Susan’s father, Alan, was a tough, successful and well-respected runner in the 1970s and early 1980s, representing Jordanhill College and East Kilbride AAC. He showed early promise by finishing a close second to GB International steeplechaser Alistair Blamire in the 1971 Scottish Universities CC Championship, in front of future Olympic 1500m finalist Frank Clement. Alan’s personal bests included: 3000 metres steeplechase 9.29.4; 5000 metres 14.25.4; and 10,000 metres 30.39.7. Perhaps his finest Performance was eighth in the extremely competitive 1977 Scottish National cross-country championships. He finished fourth in the Scottish Marathon Championship in 1974; and in the 1982 London Marathon recorded a good time of 2.22.30. Nowadays Susan’s parents live in Appin, near Oban, and when Susan (a Glasgow University engineering graduate who runs for Leeds City AC) visits, she enjoys training with her two-year-old German short-haired pointer called Piper, on an old railway line and along the forest trails of Barcaldine. Alan often accompanies them on his bike. Susan Partridge started running properly when she was fifteen. In an interview for runbritain in 2010, she said “I used to look after a horse from my local stables during the winter months and one day decided that I should try to keep fit by running to the stables and back. My Dad was a runner and although he was always careful not to put any pressure on me, he was able to give me advice on how to train and would come out running with me”. Susan realised early on that she had natural talent for longer events, which at the time were 800m or 1500m. She made an early impact on the Scottish cross-country scene, winning the National under-17 title in both 1996 and 1997. In 1998 she was 12th (second Junior) in the Scottish Senior CC championships. As an under-23 in 2002, running for Victoria Park City of Glasgow AC, she had progressed to 5000m in 16.32.31 (winning a silver medal in the Scottish Championships); and had also run the Great North Run half marathon in 76.11. In 2003, Susan won the Scottish Athletics Federation Cross-Country title and then became Scottish Champion at 5000m, as well as improving her 10,000m PB to 34.26.18. 2004 was the year that she concentrated on road running. After making her marathon debut with 2.41.44 at London, she produced an excellent half-marathon time of 73.22 (second in a race in Spain). Then she returned to the track to finish seventh in the AAA Championships 5000m in a new PB of 16.24.73. 2006 was Commonwealth Games year and Susan’s preparations included a PB 10k (33.19) and a good half-marathon (73.14) in Spain, before finishing a solid tenth (2.39.54) in Melbourne, Australia on the 19th of March. Then in July she improved her best ten mile time to 57.23. In September’s Great Scottish Run Glasgow Half Marathon another impressive PB was achieved: 72.40. 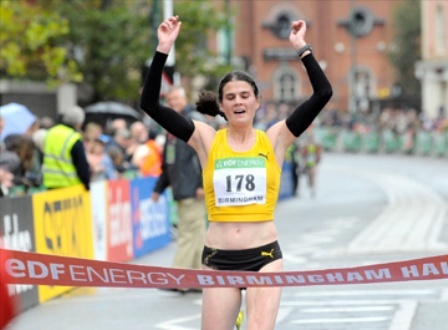 After a series of 10k races in 2007, Susan Partridge cut a few seconds off her 10 mile best (57.14), and finished the year well with 6th in the Great North Run Half Marathon (72.33 – PB) and another sixth in the Dublin Marathon (2.38.33). In early 2010, Susan Partridge ran many miles and a series of good sessions. She got a part-time job doing research into joint replacement at Leeds University and “I think that helped to give me a routine. I had previously been self-employed and although I probably had more time to train, my time management left a lot to be desired. I definitely prefer routine.” All this led to a breakthrough in the London Marathon, where she finished 17th (second Briton) in a PB of 2.35.57 (which also won her a gold medal in the Scottish Marathon Championship!) and was selected for the GB team for the European Championships at the end of July. After a couple of weeks rest, she got back into 90 to 100 miles per week training. In the heat and humidity of Barcelona she finished in 2.39.07 and Michelle Ross-Cope (14th), Susan (16th) and Holly Rush (20th) were the three scorers for the six-women GB team which won European Cup bronze medals. The website runbritain.com reported “These girls have a lot in common: they are exceedingly talented and totally driven in their pursuit of marathon success. They also have superb back-up teams that include faithful training partners to accompany them on training runs through rain and shine!” These training partners are their dogs. 2010 was Susan’s most successful year on the roads: she recorded six wins over distances from 10k to 20 miles. 2011 has started really well. In January, Susan Partridge became first Yorkshire and Humberside CC champion and secondly won the Northern CC title. In mid-March she won the Spenborough 20 mile race and a week later finished fourth in the well-known Reading Half Marathon (73.47). April’s London Marathon produced a new PB (2.34.13), 25th place (3rd British woman) and selection for the World Marathon Championships in Korea at the end of August. A satisfying training race took place at the end of June, when Susan won the Dunfermline Half Marathon in 76.26 on a testing course. This incorporated the Home Countries International Road Race Series, and Scotland defeated England for the first time in the history of the event. In addition, Susan Partridge became SAF Half Marathon Champion. Susan sent back two blog entries about this experience to runbritain.com. She was inspired by Steve’s insistence that a good runner should learn to ‘run from the gut’, as hard as possible, and realise that sometimes, in a race, you just have to go for it when it feels right and not be scared of what might go wrong. She did disagree to some extent with Steve, and still believes that in a training schedule there should be room for some easier running and steady 13 mile sessions at marathon pace. However Susan did try Steve’s morning speed sessions: 8×3 minutes with 2 minutes rest; 5×5 minutes with 2 minutes rest; 10x 90 second hills with a jog back down. Other morning sessions included one hour 45 minutes steady; or one hour ten minutes easy; or one hour 15 minutes including 25 minutes tempo. Three afternoons a week added a 30 or 45 minute easy run. Sunday, of course, is the long run – 2 hours 30 minutes at an easy pace, picking up speed a couple of miles from home. Monday: only one hour easy. Total – about 95 miles per week. Susan enjoyed the contrast in weather from February in Leeds. “If you get up at 7 a.m. in Boulder and walk out the door you’re met with beautiful sunshine, cool fresh mountain air, frolicking wildlife and quite frankly it makes you glad to be alive.” Early morning speed sessions in British ice, rain and traffic fumes might not be sensible. Unfortunately, Susan was not selected for the London Olympic marathon, after recording 2.37.45 in London 2012. Subsequently she worked on her speed, recording personal bests of 4.36.23 for 1500m and 9.19.18 for 3000m. She was selected as one of the three-women team that represented GB & NI in the World Half Marathon Championships in Kavarna, Bulgaria, where she finished 22nd. A week later Susan won the Cardiff Half Marathon in 71.10, another PB. The afternoon of the tenth of August was a very humid afternoon in the Russian capital, when 72 athletes started the Women’s World Championship Marathon. Susan, who by now had a full-time job as a researcher in joint replacement at the University of Leeds, set off very carefully, well down the field. After reaching the finish in the Luzhniki Stadium, Olympic Park, she said, “It was all about places today. I was way back at the start and for a minute wondered if I’d been a little bit cautious, but once I got my rhythm going I started to come back and pick people off.” Live television coverage made clear how well Susan was moving up throughout the entire race. Eventually she crossed the line in 2.36.24 to secure a fine tenth place (third European). In the history of the event, Great Britain previously had only four top-ten finishers: Paula Radcliffe (1st in 2005); Joyce Smith (9th in 1983); Mara Yamauchi (9th in 2007); and Sally Ellis (10th in 1991). Susan recovered well from this career-defining performance, and another highlight came on 6th October, when she ran right away from a good lead pack to win the Great Scottish Half Marathon in Glasgow. Her time (70.40) was only nine seconds slower than her fastest. Once again the whole event was televised and Susan’s powerful, determined running seemed to augur well for her hopes in the 2014 Commonwealth Games marathon in the same city. Susan Partridge should be very proud of what she has achieved, due to talent, resilience and consistent hard training. One inspiration has been Paula Radcliffe, who kept on increasing her mileage until she reached her peak. Susan has experienced a fantastic range of British and International racing highlights. She clearly loves running and should be considered an excellent role model for all aspiring Scottish distance athletes.